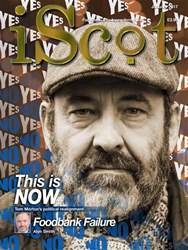 Digital Subscriptions > iScot Magazine > January 2017 > Under capitalism, man exploits man. Under communism, it's just the opposite. Revolution, according to this theory, is best seen not as a violent reaction against legitimate authority, as it tends to be portrayed by established power, but as the resort of those denied access to any other means of making countervailing power effective. Terrorism, in some of its forms at least, may be regarded as the only recourse for those denied an alternative. None of which absolves any of the perpetrators of violence, whether it be on behalf of established power or in the name of countervailence. What we are considering here is, not the particular actions or motivations of individuals and groups, but the massive and coldly disinterested forces on which those individuals and groups are carried. Within the swirling waters of politics at any level there are unquestionably ‘bad guys’; and, just possibly, a few ‘good guys’. But the waters themselves don’t care. And if we want to better understand the forces which drive our politics then it may be wise to set aside emotive rhetoric of adulation and demonisation, the better to discern what lies beneath.